You’d never guess that 2011 graduate Lindsey Smith is in her early twenties: with a successful health coaching practice in Pittsburgh, PA, a published a book, and a completed an international book tour, she’s thriving in a self-owned business that she built in less than three years. That’s the sort of achievement our graduates are capable of. They posses an unwavering dedication to transforming the world. The start to Lindsey’s journey is a common one: an okay job, struggles with her body image and self-confidence, crappy relationships, and a life lived pleasing others as opposed to herself. After enrolling in the Health Coach Training Program, she’s discovered what it means to be healthy, to love herself, and to stop craving and start living! Here’s how she got started and how she’s accomplished so much. Like most people, I was feeling unfulfilled. I had a job that was okay, but I was working a lot and not seeing much benefit (emotionally and financially). My health was okay, but my cholesterol was a little high for being only 21 and I was still internally struggling with body image issues. I had no spiritual life and was taking a dating hiatus after being in relationships with people that were not on the same track as me. To top it off, my emotional food problem turned emotional drinking problem. I was a closeted binge drinker. I was struggling with this deep sense of perfectionism and doing things to appease everyone else, but I was not living in alignment with my true purpose. Out of college, I started working for different chiropractors, helping them grow their practices. This newly found career path led me to discover how much I enjoyed helping people and seeing others get well. However, I found myself working over 40 days in a row, stressed out, fast food hopping, and gaining weight. I was miserable. I needed a way out so I jumped at the first job I could find, which happened to be with another chiropractor. He, however, realized the importance of wellness, balance, and nutrition. I met a Health Coach at a networking event and we chatted about IIN! I enrolled—no questions or doubts entered my mind. I KNEW this is what I was meant to do. How did your life change after enrolling, both personally and professionally? Since enrolling at IIN, I personally become vegetarian, lost 30 pounds, gained more confidence, quit drinking, gained new friends and a business network, started dating and recently got engaged, found a spiritual practice that fits me, and became more financially stable. Professionally, I have started a successful health coaching business, opened an office, traveled to Costa Rica with IIN, published my first book, been featured on KDKA Pittsburgh TV and other media sources, referred over 14 people to IIN, been a sought-after guest speaker for local and national conferences, been endorsed by several local physicians, and am working on my new snack book, which features IIN grads. Which topics and concepts were most beneficial for you? The biggest piece of knowledge was the realization of bio-individuality and primary food. I knew of these things, but the school put it in a way that seemed I was looking at it with fresh eyes. I also learned the importance of community and the idea of a collective conscious group to change the world. I feel so inspired to see my classmates succeed, to help my own clients, and to enroll students in the program. Each lends a ripple effect into the world of change. Currently, I have an office with two seminar rooms and a gym. We hold workshops, events, and I coach individually. 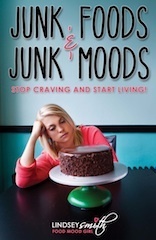 With the release of my new book, Junk Foods & Junk Moods: Stop Craving and Start Living, I am focusing more on my career as a writer and a speaker. I have been traveling on my book tour and have had a chance to take my book to a global level! Because of that, I recently hired another coach for the office to be able to take clients and teach classes when I am not in town. I have been 100% self-employed since September 2011 and I am loving every minute of it. How did the Health Coach Training Program support your success? I am constantly amazed at the support the school offers its students. Sometimes I feel like it’s really too good to be true because of the continuous support it offers even after you graduate. I will never forget the “Thank You” package I received after the Miami Conference. I was blown away by this small gesture. Take how the website has grown and all the new things that are constantly being added. It shows the staff listens and cares about what’s going on with the students and how much they aim to make the school even better! The career I have established, the people I have met, and the self-improvement I have made in the course of just a year have all been incredible. It’s amazing to meet people from all over the world with a passion and zest similar to your own! This education has also enabled me to be seen as an expert in the field of health and nutrition, giving me all the tools I need to succeed! How do you help your clients be successful? Is there a stand out client relationship or session you can recall? I love being able to utilize my stories, knowledge, and information to move people to create small changes that in turn, add up to big results. Seeing transformation happen in people is one of the most rewarding things ever! I was working with a tween client and she said to me, “If it weren’t for you, I would still in the back of the cafeteria eating bags of chips because I felt sad. I now have confidence in who I am!” That’s what it’s all about!